Almost a year ago, I presented a double review, of two EPs. This is the first time I have done it since, and once again Suzi Ragsdale is one of the artists. I would like musicians who have EPs out to know that I will consider your work even without a Ragsdale EP to pair it with. Note: Less of the Same is only available for purchase in a two-pack with Best Regards. Suzi Ragsdale made her debut with Best Regards. I was very much taken with the originality of her arrangements, as well as their delicacy. 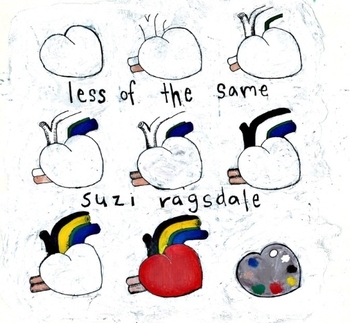 But the new one is called Less of the Same, and she means it. Here are three rockers and three tender ballads, and Ragsdale mostly delivers the goods, but this is not delicate music. This is a set of solid performances of familiar song forms. The writing lifts these songs well above the level of cliché. The emotions are honest and heartfelt, but you can also hear Ragsdale’s influences. The title track actually is a surprise in that sense. The song less of the same has a distinct 80’s feel to it. It almost sounds like Rupert Hine, who produced the biggest hits of the band The Fixx, is back. Less of the Same does not fit well with the rest of the album musically, but the lyrics belong here. The album opens with a cover of Darrell Scott’s song Full Light. Ragsdale has improved on the original, adding a mandolin riff that really pulls the song together and drives it home. The other two rockers, including Less of the Same and also Troublemaker, are cowrites with Verlon Thompson. Ragsdale made her debut years ago as half of a duo with Thompson, but now she records as herself, and he is billed as a guest. The three remaining tracks are by Ragsdale only, and they are the ballads. Here is where Ragsdale’s vocals are the strongest and the emotions clearest. Overall, the songs are about the risks of love. At the start, one must decide whether it is worth the risk getting hurt to dare to love again. There comes a point where the decision is whether to take a relationship deeper. Emotional scars from old relationships surface at odd moments. And even deciding to accept the end of a relationship is risky. All of that and more is found here. These songs are snapshots of moments in relationships that are potential turning points. Ragsdale makes an excellent choice in covering the Scott tune, and follows that up with quality writing of her own. So after Best Regards, I was eager for more of the same, and got Less of the Same instead. Now I have no idea what to expect next, but I look forward to finding out. 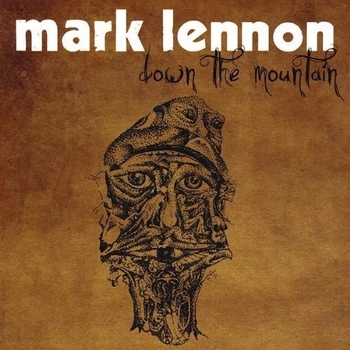 Mark Lennon is a much less complicated songwriter, but there are compensations. Here, he presents a set of songs that have a familiar feel, but he nails the feel of them perfectly. I would say that Down the Mountain is a southern rock album. The sound is towards the acoustic side, with acoustic guitar and piano featured prominently. Add bass and drums to supply power and keep things grooving. Then add electric guitar, pedal steel, and sometimes organ, to complete the feel. Finally, there are female background vocals, and Lennon uses these perfectly. The piano and electric guitar get most of the solos. Lennon is a generous bandleader here, giving these players plenty of space to strut their stuff. Lennon sings these songs in a high tenor. He never stays down for long, even when the songs express negative emotions. That’s appropriate, because this is comfort music. Lennon’s songs never present a situation without hope. There is always the possibility of love triumphing, even when the lyric doesn’t leave things that way. The album opens with two happy songs. Down the Mountain exults in the possibilities of that first really warm day of summer, and Lennon asks a woman to share it with him. And My Hometown is a fond evocation of small town life. The next song, Wildside, is a highlight. The song is a duet with Simone Stevens. I looked her up, and I found that she hasn’t done anything new on her own since 2005. Wildside makes me hope she will soon. The song is a cowrite with her and Lennon, and it has a slightly different feel to it. For one thing, the arrangement includes a trumpet. On the chorus, the trumpet plays two parts, one with a mute and one without, and they form a duet. Lennon and Stevens present a man and a woman in a game of courtship; he advances and she pulls back. The tension is delicious, and they wind up apart, but maybe it’s not over. The remaining songs concern breakups and separations. Two people are separated, or a hoped for relationship hasn’t materialized, but there is still hope. Lennon never shuts the door completely. And he never gives in to despair, either in his words or his singing. The song I have chosen to present, Tennessee, is a musical change of pace. The arrangement is simple, just acoustic guitar, pedal steel, and mandolin. This allows Lennon to show off his own guitar playing, and it leaves his vocal without the cushion it enjoys elsewhere. So the emotion of the song comes though stronger. This is a song of separation, and Lennon’s most convincing emotional performance. Overall, what we have here is a happier album than I usually review. Sorrow can certainly inspire great art, but happy songs that ring true are much harder to find. Down the Mountain also sounds to me like a group of musicians who are really enjoying what they are doing. And that makes it a very enjoyable listen.